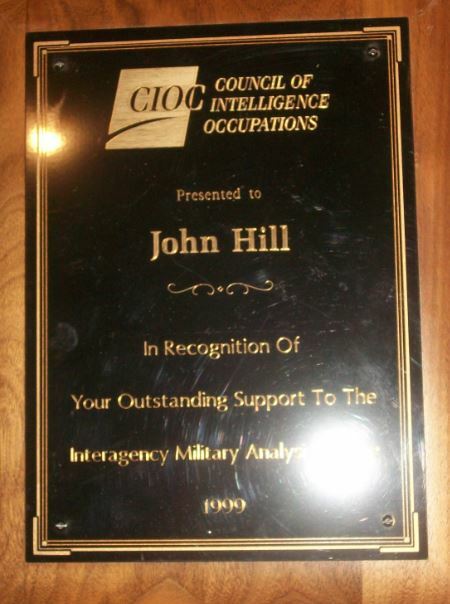 With his sudden passing, my father, John Hill, leaves behind an impressive legacy. Though he left this world way too early at the young age of 69, he did not leave without having achieved much recognition for his dedication to his career, talents, family and friends. Due to his extreme creativity, dedication and tenacity, he received multiple awards, many of which cannot be mentioned in light of the capacity in which they were earned. H.G. 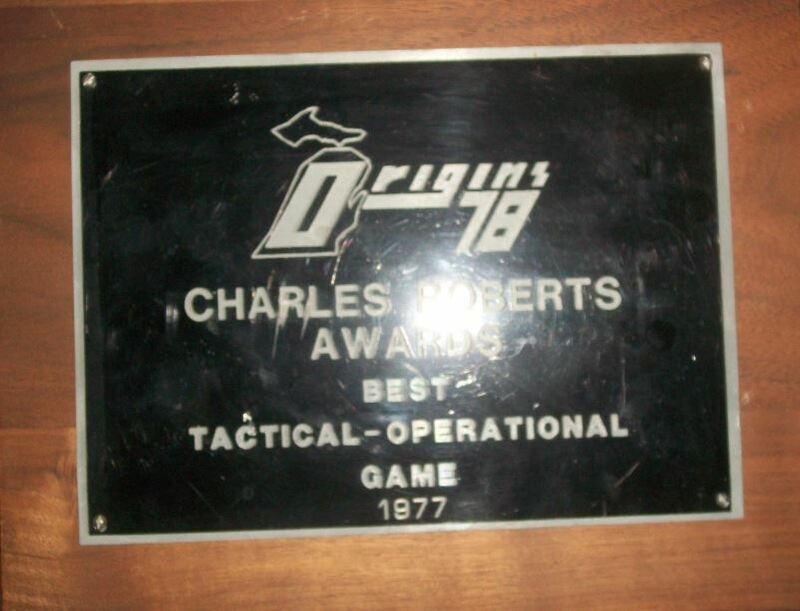 Wells Award ~ Best Miniature Rules 1983 ~ Johnny Reb Adventure Games Inc.
As many of you know, John’s first wargame he designed was Squad Leader which led him to being inducted into the Hall of Fame in 1979 in reference to the award above. His second most popular wargame was Johnny Reb which led him to receiving the H.G. 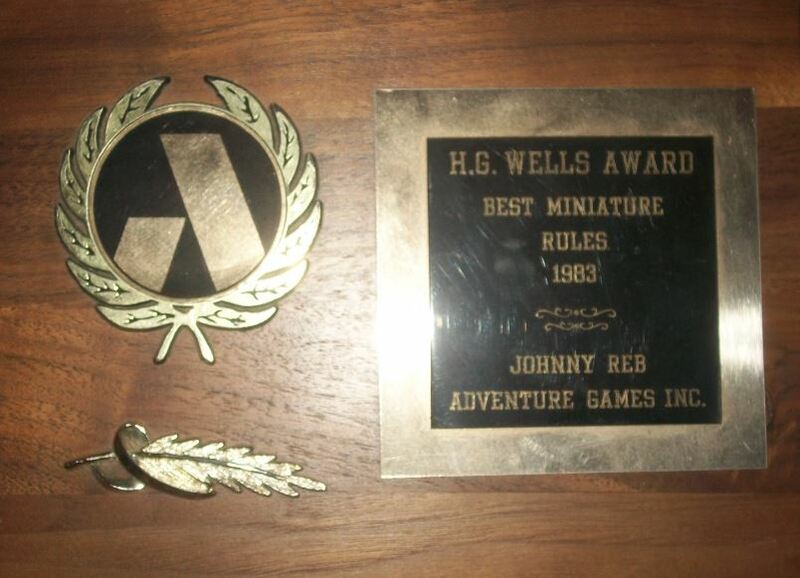 Wells Award for the Best Miniature Rules for 1983. Thank you for reading this post on some of my deceased father’s awards and recognition plagues. These awards represent only the highlights of his life-long enthusiasm for the wargaming industry. There were many other awards of lesser significance or simply shall not mentioned. Please feel free to leave a comment or question below and I will promptly answer you. I miss John every day. We miss him too. Thank you for stopping by today. I will be posting more awards today, because I know you need them for the eulogy you are giving at Historicon. Great dedication site; and, you’re right, we would have been good friends, I wish that I had met him! Thank you for leaving a comment today. 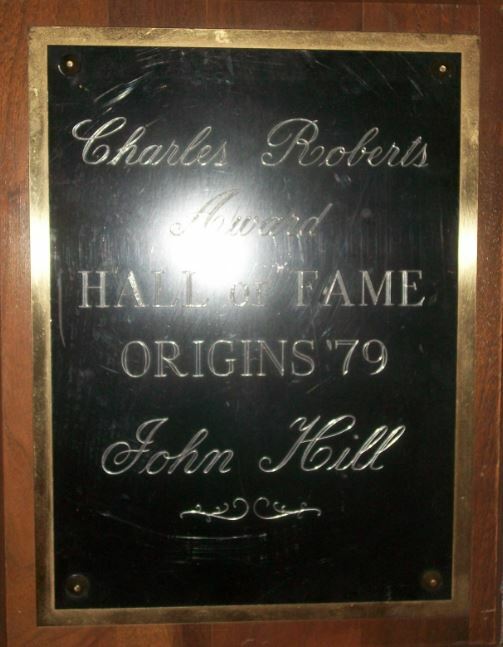 I am glad you enjoyed the tribute site to my father, John Hill. Have a wonderful day! Thank you for sharing. Well deserved awards. You are most welcome. Talk with you later. what a great tribute to your father, John Hill. Sounds like a great man. You are keeping his memory alive through this page. Well done. Such a touching and poignant idea for a website. Really beautiful. How long did it take you to set it all up? It’s such a great idea. Hopefully I won’t have to do anything like this for a long long time but it’s great to see such a thoughtful person. Thank you for the compliment on my attempt to create a touching and heartfelt tribute to my a great man. I am delighted you appreciate it’s beauty. As far as long it took me to initially set it up, well when I first designed this site, I did not like how it was turning out and became frustrated with my efforts, so I deleted it and started over. The whole process took me about a month of working everyday on it. I too hope it will be a long time before you have to do anything like this. Nobody ever wants to loss their loved ones and family members. I’ll seriously have to look into your father’s works further. I was born in 75 and as a result I got to play many miniature based, fantasy/battlefield board games. I used to absolutely love them and feel it’s so sad that the Xbox has taken a lot of the youth of today away from them. Thank you for visiting again. It is good to hear from you once again. I know exactly what you mean about how technology and the electronic game consoles such as Xbox has taken over from the traditional tabletop games that kids our age used to play. I too was born in the 70s and grew up on these types of board games as well. They did make Squad Leader into an electronic game to try and appeal to our more modern younger gamers. Squad Leader, even the electronic version, is still worth looking into it when you have a chance, because players still learn historical facts about the battles fought.